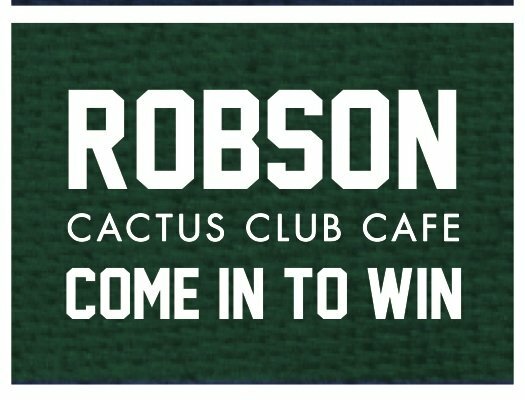 We are excited to announce a Robson Cactus Club Cafe exclusive: The Robson Mystery Locker Challenge. What is the Robson Mystery Locker Challenge? On select calendar dates (listed below) throughout the entire 2011 NHL season , when you watch the game at Robson, you can also win some great prizes. Some examples of prizes include Private Tasting Events for you and your friends (valued at $250), Cactus Club Cafe Gift Cards, NHL jerseys, and the ultimate prize: NHL tickets! For every menu item that you order during the game, you will receive a ballot to put into the draw for the prize. The draw will happen at the end of the night and the prize will be a mystery. Sleeves of Molson Canadian will be offered for $4 on all game nights. For more details, ask your server. Reservations welcome.